As the weather cools in Europe in autumn, hold on to that summer feeling by chasing the sun to one of Emirates’ many Far East and Indian Ocean destinations for that perfect autumnal getaway. Emirates has prepared a special flash sale bookable from today until August 6 to provide the great deals for flight tickets to a whole range of destinations. Stretching from the Indian Subcontinent all the way down to Australia and New Zealand, Emirates flies to over 20 destinations across Asia and the Pacific. 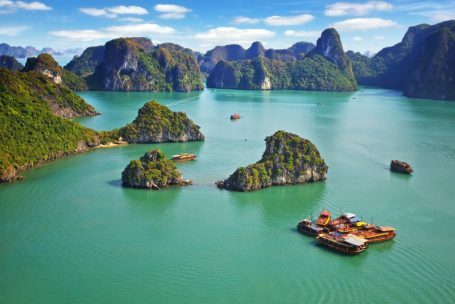 From the bustle of the lively Vietnamese cities, to the majestic temples of Cambodia, to the cool hill stations of Sri Lanka, to the powder-sand beaches of the Seychelles – each destination promises something new for the traveller. A popular destination for backpackers and families alike, the Cambodian capital of Phnom Penh, with its temples, pagodas, palaces and street markets, offers tourists a wide range of things to see and do. as well as for those planning to travel throughout the rest of the country, exploring the beautiful Cambodian islands with their colourful coral reefs and white sand beaches. Especially on the long haul flights, a great inflight entertainment system makes the time fly. Emirates’ pioneering system ice has more than 2,500 channels providing information, communication and entertainment. Passengers can choose from movies, TV series and shows, music or games in multiple languages. More than 40 channels are dedicated to children. Emirates is also the first airline to have a dedicated eSports channel. Sport enthusiasts can watch ESL channel showcasing eSports events, exciting storylines and major plays. Once tired, Emirates helps its passengers to sleep well during long-haul flights thanks to the new sustainable blankets made from 100% recycled plastic bottles with patented ecoTHREAD™ technology, which are available in economy class. Purchase the Emirates economy class ticket to Phnom Penh for 15 690 CZK* (for bookings made on emirates.com between July 24 and Aug 6 2017). The special fare is available for travel periods of Aug 3 – Oct 15 2017* and Nov 18 – Dec 11 2017 and includes fuel surcharges and airport taxes. Do not miss it! Hanoi, the ancient capital, still retains much of its French colonial charm amid the hustle and bustle of one of South East Asia’s largest cities. On the other hand, Ho Chi Minh City (formerly Saigon) in the south is even more frenetic place, where you’ll be assaulted by the sights, smells and sounds of this hectic city of 8 ½ million people. Here you’ll find some of the most luxurious hotels, fanciest restaurants and tastiest street food in the country. no longer needed to stop in Yangon before reaching the Vietnamese capital, which now saves up to 2 ½ hours of travel time. a place of study and contemplation dedicated to Confucius, and Hoan Kiem Lake, where just after sunrise you’ll find locals practicing tai chi. where you’ll find some of the world’s most unspoilt beaches. Even before arriving in Vietnam, passengers of Emirates can enjoy regionally inspired cuisine served on board with meals made using the freshest, locally sourced ingredients, with new menus updated every month. Emirates is always learning about regional cuisines, new techniques and, most importantly, what the customers love to find on the menu. or fly to Ho Chi Minh City for 15 590 CZK* (fuel surcharges and airport taxes included). Just keep in mind, you must make the trip of your dreams through the periods of Aug 3 – Oct 15 2017* or Nov 18 – Dec 11 2017.
a sparkling blue ocean full of sea life, and a range of sporting and other activities to keep you busy. Of course, it’s the beaches and sea that brings most travellers flocking to the Seychelles. There are so many beaches to choose from, but one of the best is Anse Source D’Argent. where you can explore not only the reef or granite walls, but also some of the world’s most famous shipwrecks – thanks to the pirates who have long called the Seychelles home. Emirates offers a daily service from Dubai to Mahé, the largest of the many islands that make up this unique country and where the capital Victoria is located. Emirates offers its passengers a generous baggage allowance of up to 35 kg in Economy Class, 40 kg in Business Class and 50 kg in First Class. The standard diving equipment will be accepted as checked baggage and part of your standard baggage allowance. Emirates.com features the special fare offer of 21 190 CZK* to the Seychelles´ Mahé available for travel periods of Aug 3 – Oct 15 2017* and Nov 18 – Dec 11 2017. Economy class flight tickets have to be purchased between July 24 and Aug 6 2017. Fare includes fuel surcharges and airport taxes. Let´s travel smart! Colombo, Sri Lanka´s a historic city, is imbued with a mix of architectural styles from the Portuguese, the Dutch and the British. This city buzzes with life, where tuk-tuks compete with buses blasting Indian pop music, and where a new crop of design hotels, art galleries and chic clothing boutiques is emerging among the street bazaars. Outside of the city, travellers head to Sri Lanka’s coastline and its beaches, like those of Kalpitiya, Arugam Bay, which is tailor-made for surfers, and Unawatuna, which is touristy but lots of fun. You can also go whale-watching from nearby Mirissa. To escape the heat, you can head into the hill country, where tea plantations cover rolling hills and beautiful views are everywhere you look. For foodies, Sri Lanka boasts one of the most varied and interesting cuisines in the world, a heady combination of delicate flavours that range from coconut to curry. but there is so much more for travellers to see and do on the ‘Jewel of the Indian Ocean’. Stay connected with friends, family or colleagues on the ground with Emirates’ Wi-Fi, mobile phone and data roaming services. Post a status update, make a call or send emails as you fly. Passengers on Emirates flights can look forward to recently doubled Wi-Fi free data amount of 20MB. Emirates Skywards Platinum and Gold members can enjoy free unlimited Wi-Fi during their Emirates flight, regardless of their class of travel. Take the advantage of flash offer on emirates.com and fly to Sri Lanka for 14 690 CZK*. The special price for economy class is available for travel periods of Aug 3 – Oct 15 2017* and Nov 18 – Dec 11 2017. Flight tickets have to be purchased between July 24 and Aug 6 2017. Fare includes fuel surcharges and airport taxes. * Tickets at these prices are unchangeable and non-refundable. Inbound travel not permitted: Aug 23 2017 – Sept 03 2017.